Fox’s national correspondent, Bryan Llenas caught up with with our founder, Ethan King while he was in New York City last week. 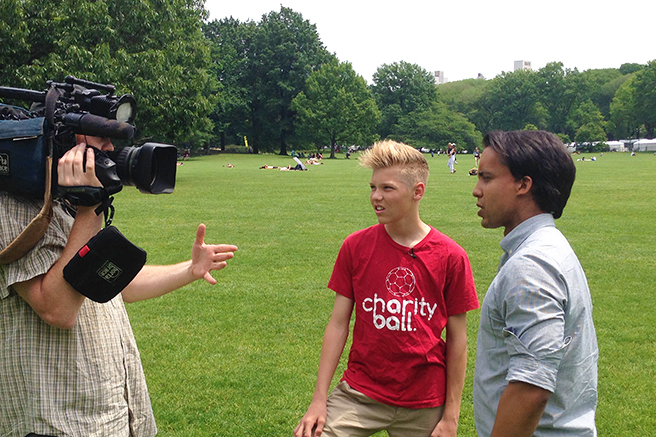 (Bryan is currently down in Brazil covering the latest and greatest World Cup action) While kicking the ball around in Central Park, the two of them talked Charity Ball and the mission to share The Beautiful Game with kids around the world. US Fox affiliates aired the story over the weekend. If you haven’t seen it yet, you can check it out below. 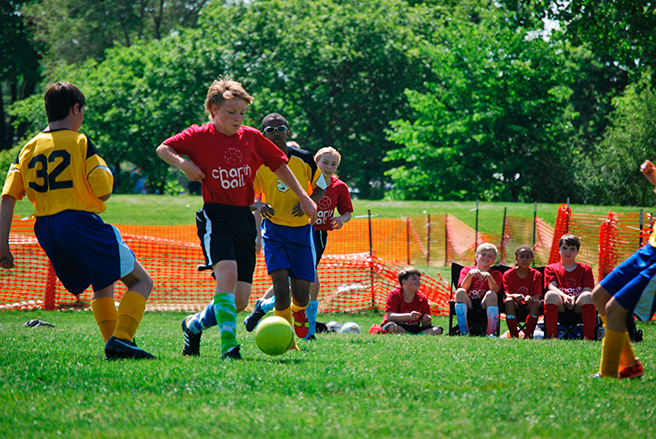 A few weeks back, a small U12 team from Naperville, Illinois decided they all wanted to play for something bigger. They designated one of their final league games to raise money and help kids around the world get new, quality soccer balls. I caught up with Coach Chris Bonney for quick interview on how things went. Ethan: Whose idea was it to dedicate a season game to play for Charity Ball? Chris: I learned about Charity Ball through Twitter. I’ve been following so many things around the 2014 FIFA World Cup and your organization popped up. I checked out your website and watched the “Pass the Ball” video and fell in love with the idea. I was surprised I had not heard of it before. When I saw a picture on the website of a team wearing Charity Ball shirts (LINK), I thought, “this is perfect, exactly what we want to do”. We have a great bunch of kids on our team who understand the power of generosity and are always looking for good things to do. When I told them about my idea, they fell in love with it. Ethan: Why did you guys decide to do this? 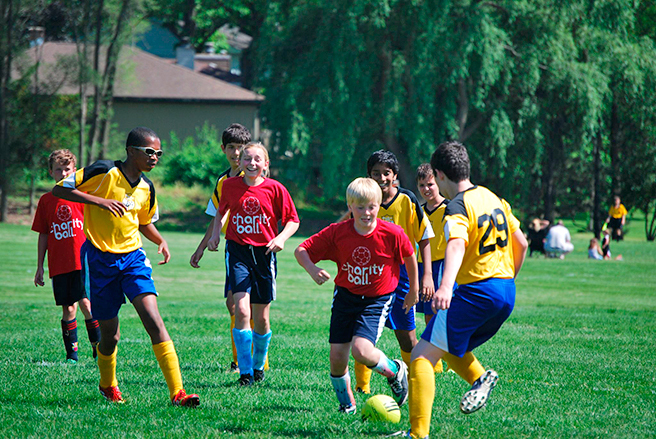 Chris: Once we were familiar with Charity Ball and understood the level of awareness we could bring to our community, friends, families, and other soccer compadres – we thought it would be a great way to get the word out. We love what Charity Ball does. We think it’s a really cool thing. Like you, we wanted to give back. Ethan: What would you say to other teams/clubs/people that are thinking about doing something similar? Chris: I would say go for it! Do it tomorrow if you can. Do it every game! It was a great experience, not only working with your organization, but also having people say to you, “Hey, what’s Charity Ball?” It’s not only a great way to bring attention to soccer, but also what soccer can do for others. Ethan: What was your favorite part? Ethan: How did it make you and the kids feel that you were playing for something bigger? Chris: Awesome. It felt awesome! When we went to a Chicago Fire MLS game the next day, everyone showed up in their Charity Ball shirts, and we didn’t even plan it. Everyone went home that night, washed their shirt and wore it the next day. It showed how passionate the kids were about your organization and making a difference. They all also wore them to school on Friday. I also think as a coach, it also inspired them to play better as well. Chris, thanx for the interview, and special thanx to team Naperville Fire for helping us share The Beautiful Game with other kids around the world. Better yet, thanx for reminding all of us that kids can make a difference and change the world.